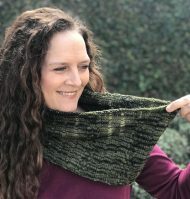 As a tribute to the historic Savannah location of my Spring 2018 Knit For Fun Retreat, the yarn and stitch pattern in this cowl represents ancient trees covered with Spanish moss. The yarn is Jones Street Sport from Savannah’s own The Copper Corgi Fiber Studio, dyed in a custom Moss and Leaves colorway. The stitch pattern includes mirrored cables to reflect gnarled tree trunks and dropped stitches to reflect the lacy effect of moss hanging off limbs. The stitch pattern, which repeats over 25 stitches and 6 rows, is based on a simple k4, p1 rib so, other than the cable-crossing rows, the knitting is quite straightforward. The lacy vertical columns are created on the bind-off row by dropping the purl stitches each side of the center plain knit-4 column. So easy!